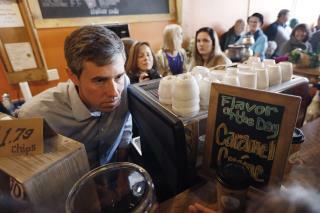 (Newser) – Democratic presidential contender Beto O'Rourke on Friday acknowledged making mistakes as a teen and as a candidate, responding to criticism of his campaign rhetoric toward his wife, as well as writings he produced online when he was young. During a taping of the Political Party Live podcast in Cedar Rapids, Iowa, he addressed criticism of his campaign-trail joke that his wife, Amy, has raised their three kids "sometimes with my help." O'Rourke made the comment at multiple campaign stops during his first swing through Iowa, including earlier Friday, eliciting laughs each time, but he also drew criticism as being insensitive to the challenges faced by single parents raising children, per the AP. O'Rourke said the criticism of his "ham-handed" attempt to highlight his wife's work in their marriage was "right on." "Not only will I not say that again, but I will be much more thoughtful in the ways that I talk about my marriage," he said. Is see many many more "apologies" in O'Rourke's future..
No a lot from the MSM but if he were a Republican they would have 24/7 coverage.